(Reuters) - Walt Disney Co's ESPN network posted a decline in profit, overshadowing the blockbuster success of "Star Wars: The Force Awakens," which drove quarterly income and revenue ahead of Wall Street expectations. Investors seemed nervous about the future prospects for Disney and other older media companies, sending its shares down 5.2 percent to $87.56 in after-hours trading. The media networks unit that includes sports network ESPN, the Disney Channels and ABC recorded a 5.6 percent decline in operating income to $1.41 billion. That was due in part to higher programming costs at ESPN and a decline in subscribers to the sports network, which offset an increase in advertising revenue. ESPN programming costs rose due to a change in the timing of college football bowl games, and the strong dollar also hurt results, Disney said. Chief Executive Bob Iger said ESPN subscriptions had risen recently, but investors and analysts are concerned that Disney and other media companies are being abandoned by "cord cutters", especially younger viewers who do not watch traditional television or buy pay TV packages. "I actually believe that this notion that either the expanded basic bundle is experiencing its demise, or that ESPN is cratering in any way from a subscriber perspective is just ridiculous. Sports is too popular," Iger told analysts on a conference call after the earnings announcement. "We fully expect our media networks, including ESPN to continue to deliver bottom line growth, which means ad revenue growth will continue to outpace spending," Iger said during the call. Shares of MTV and Paramount owner Viacom Inc on Tuesday fell 21 percent after missing Wall Street sales estimates for a fifth straight quarter. The concerns surrounding ESPN took the shine off of "The Force Awakens", the first "Star Wars" movie produced by Disney after it bought Lucasfilm from creator George Lucas in 2012 for $4 billion. Disney spent more than $200 million to produce "The Force Awakens," the seventh installment in the series. 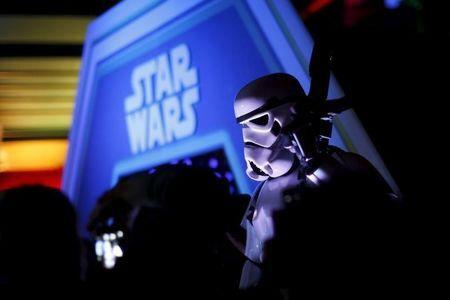 The stellar launch of the movie helped the studio business almost double its operating income to $1.01 billion. Disney's quarterly net income rose to a record $2.88 billion, or $1.73 per share, from $2.18 billion, or $1.27 per share, a year earlier. On an adjusted basis, the company earned $1.63 per share, that handily beat analysts' average estimate of $1.45 per share, according to Thomson Reuters I/B/E/S. Revenue rose 13.8 percent to $15.24 billion in the first quarter ended Jan. 2, which beat analyst expectations of $14.75 billion.